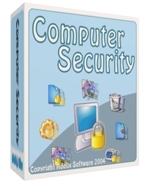 Computer Security - Security should be a very important and concerning issue in you every day activity. No matter you are part of a company or a home user, it is very important to protect your work. You need a good security software. Computer Security protects you encrypting sensitive data, hiding it in innocent carriers, allowing safe transfer through encrypted self-extracting package, delete files beyond recovery and even locking application from your children or " welcomed quests". hide files into innocent carriers. over 20 encryption algorithms like 3Way, Twofish, Cast 128 , Saphire , Blowfish, Rijndael, Diamond II and many more. crypt and decrypt files no matter their size. special algorithm to delete files, the files can't be recovered with any kind of hardware or software! lock personal applications and access them with a mouse click. create self-extract package containing encrypted information. easy to use explorer like interface. Network and Dial-up Password Revealer - Dependable password recovery solution for network and dial-up connections !